The SchoolCast Dashboard allows parents or faculty members to log into www.myschoolcast.com and update their contact information. All users are given a unique username and password that allows you to access the Dashboard. Once the parent or faculty member has logged in, the system will bring up the SchoolCast Dashboard. If this is the first time to login, you will be asked to change your password and to provide an email address that can be used for password recovery. Once you have changed your password, you may access the Dashboard. At the top is an area where you can edit your user name, password and primary/recovery email. The Dashboard allows you to keep your information updated. 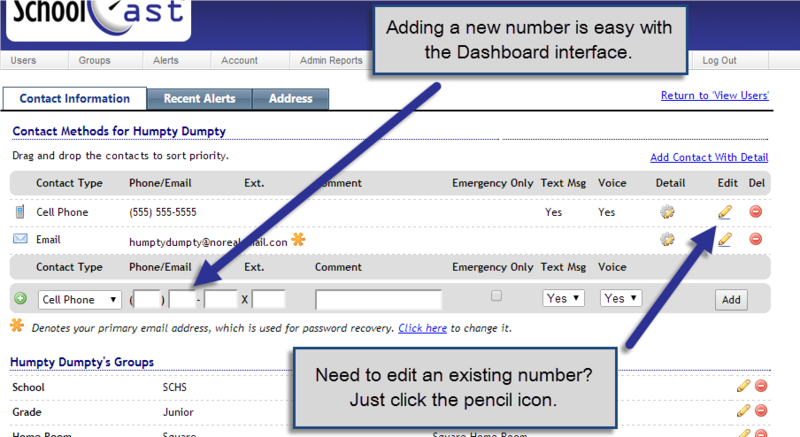 Any phone numbers and email addresses can be edited by clicking on the pencil icon to the right of the given contact and then clicking inside the text box to make the changes. Once you have completed the changes you must click on the computer disk icon to save those changes. You may also delete entries by clicking on the red circle with the minus sign icon to the right. New contact numbers and email addresses can be added by selecting the proper lable from the Contact Type pull down box and typing into the blank, then clicking the Add button. When you are adding or editing a Cell Phone number, there is a column for “text messages” and “voice calls”. There is a drop down box to select “yes” or “no” on your preference for receiving those type of messages on that particular cell phone. The Dashboard allows you to keep track of all past alerts. Any voice alerts, email alerts, or text alerts sent by SchoolCast are kept under the “Recent Alerts” heading. Clicking on the speaker icon will play the original voice recording while clicking on a page icon will display the text of an email or text message.